The building blocks of water, along with other minerals, have travelled through the universe on tiny specks of space dust since the big bang. What is really interesting though, is how it managed to arrive in life-giving form to our solar system and our planet. There are many speculated theories as to how water arrived on earth, and it may be any combination of theories that resulted in the massive amount of water on earth specifically. As a general belief, earth likely contained some water at its inception that did not show itself for many years due to the hot volcanic surface that took awhile to cool down and allow earths water, whether in steam or at the core, to arrive at the surface. The rest of our water likely arrived from collisions with compounded space dust, either comets or meteorites from the Oort Cloud. However we are not the only planet in our system that has retained water, others have it in different forms and different amounts. What can be agreed upon, is that we as earth-dwellers are in the most uniquely life-giving position in our solar system. First, we need to understand what water is. Water is made out of three molecules, two hydrogen atoms and one oxygen atom. Asking the origin of these individual minerals may be as difficult as the origin of the universe itself. However it can be inferred that over time floating through space, these individual atoms formed their first covalent bonds and water was created. There is currently no doubt that much of our solar system’s water is of extraterrestrial origins. It either was here upon our solar systems inception years after the big bang, or it arrives from ancient extraterrestrial sources from our Oort Cloud. 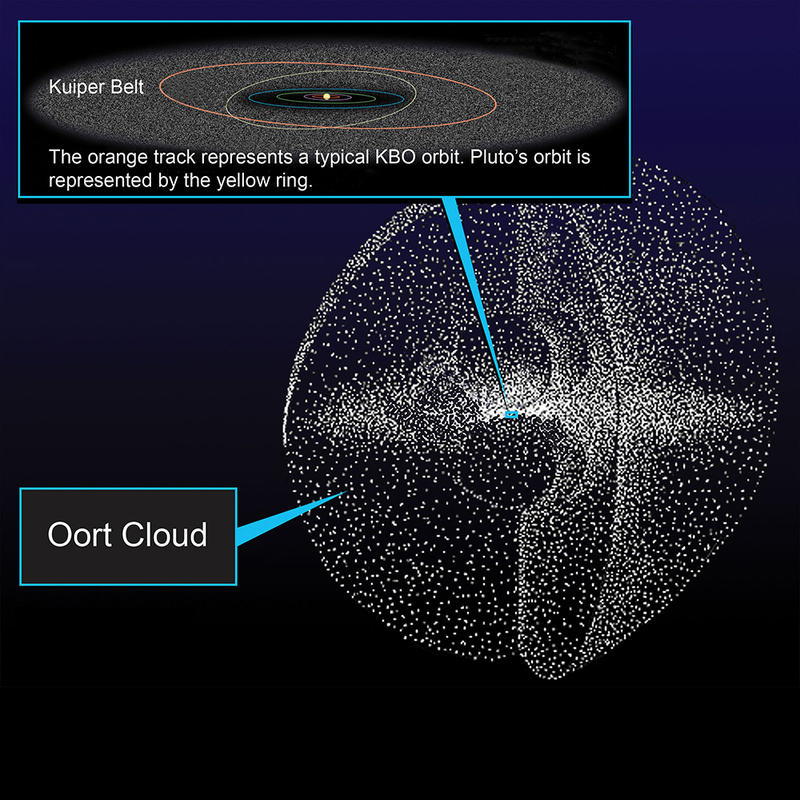 What is An Oort Cloud? 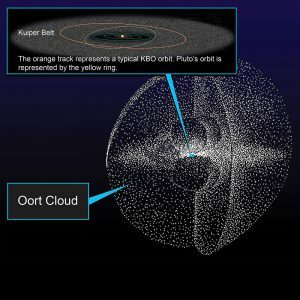 The Oort Cloud theory surrounds the existence of a giant icy mass containing ancient comets and “space dust”, sitting at the edge of our solar system and occasionally things escape. Named of Jan Oort, its existence is linked to the origin of long-period comets. The introduction of these long-period comets therefore continually provide new minerals to our planets when contact is made. A common theory is that some of our earth’s water was introduced through collision with comets from the Oort Cloud. However, it would have taken an incredible amount of large-scale collisions containing a lot of water in order to fill the earth’s oceans. It is more likely that the earth already contained some water at its inception. It is believed that for many thousands of years the surface of the earth was a volcanic ball of magma. For water molecules to survive it would have been stored under the surface or as released steam. Only once the earth cooled after thousands of years could this stored water take home on the surface. So with all of these water molecules in our system floating around on space dust and making contact through comets, why is it that earth has retained so much? We now know through space exploration with rovers that mars contains water, although frozen. Our habitability likely has to due with our perfect distance from the sun. A simple observation of our solar system shows us as a big blue marble, if we were any closer to the sun we would burn up along with our water. If we were any further (like mars) our water would be frozen. The perfect retention of our water also has to due with the way minerals enter our atmosphere, it creates a happy environment for oxygen-rich minerals to form water. All of these variables create a happy coincidence for us as humans, who rely on water to survive. It opens the door of curiosity, if it was possible in our system, why not others? The introduction of water to our planets likely existed at their inception, but also is continually introduced due to the Oort Cloud’s resource. While other planets retain some water in other forms, earth’s amount of water and its ability to retain it makes it incredibly unique. If our water is of extraterrestrial source, it only makes sense that water would exist in liquid form near other stars and allow the possibility for life. This all helps prove that without definite understandings, life happens anyways in an expanding universe. L. Liu, Earth and Planetary Science, V 227, 179-184 (2004). Science, V 313, 5792, 1360 (2006).